In the early and mid-1920s, an increasingly prosperous population looked for entertainment and recreation outside the home. But that entertainment had to be available to the residents of local neighborhoods since only a minority of households owned vehicles, and no expressways were available to allow rapid movement across substantial distances. As a result of those constraints, the city of Detroit still contains many architecturally significant ballrooms and theaters. The Redford Theater is one of them. Recall that this theater, as well as the magnificent State and Fox Theaters on Woodward in downtown Detroit, were built in an era of silent black and white films. This meant that a massive organ and skilled organist were need to make the movies much more enjoyable. Movies have always been linked to fantasies, so theater designers borrowed themes from exotic locations around the world. Very many Asian and Middle Eastern influences were incorporated into the Fox. The interior of this Redford Theater was designed with Chinese and Japanese themes in mind. For patriotic reasons, the Japanese themes were removed or toned down during World War II. This is a red brick structure with a symmetrical, two-story front. Business considerations led the architects to flank the theater with storefronts abutting Lasher. If you look to the second story, you will see that the designers sought to make the building attractive with Corinthian capitals and a tympanum containing the traditional comedy and tragedy masks to clearly demark this as a theater. There is a less attractive yellow and red enameled metal marquee. I doubt that this resembles the original marquee. The building includes a valuable Barton organ. 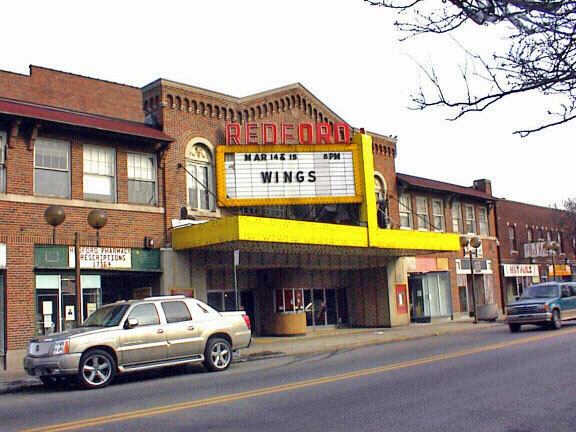 For this reason, the Motor City Theatre Organ Society leased the Redford Theater beginning in 1973, and then purchased the building four year later. Since that time, that organization has been gradually restoring the building to its original splendor. The interior was completed first and, by 2003, their efforts were devoted to restoring some of the second story exterior along Lasher. The website listed below provides extensive information about the history of this building along with many period pictures. Architect: Ralph F Shreve of the short-lived Verner, Wilhelm and Molby firm. Apparently, this is the only theater this firm of architects designed. Architectural style: Exotic Revival. This style was pretty much limited to theater built in this era. Use in 2003: The Motor City Theater Society uses the building for organ concert and for the showing of films, sometime accompanied by organ music.